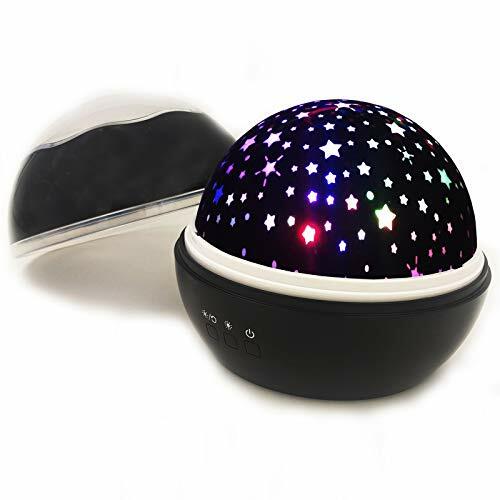 The ZHOPPY Stars and Moon Starlight Projector Night Light Bedside Lamp create an awesome and relaxing environment for your little child during night time. 3 simple buttons allow you to choose your favorites combination of warm light, blue light, green light, red light as you wish. The star light is projected by 4 LED beads which is safe. It is bright enough to showing on the ceiling and wall while not too bright to affect sleeping. There is no worry about hurting the eyes of your little kid. A ceiling filled by colorful and interesting stars and moon will create a joyful mood for your kid before a nice sleep. Your kid will love it more than counting sheep before going to sleep. It can be operated by connecting the included USB cable to USB power source (e.g. computer, USB wall adaptor, power bank and so on) or by 4 x AAA batteries. The newly designed night light can project colorful lights with the cover. In addition to the popular Stars & Moon projecting film, it also comes with a newly designed Underwater World film. You can easily bring your child an underwater world by changing a film. What make it even better is that it can also project beautiful colors lights without any film. We learnt from customer reviews, unlike previous version, the redesigned button control allow you to turn it on /off directly. MODES: 9 different combinations of warm, red, green and blue light. It has a tiny motor to rotate the projector film cover. The stars and moon will move slowly. USAGE: Warm Light / Rotation button to control turn on / off Warm Light and Rotation; Color Light button cycles through color options; Main Power to turn on / off the whole night light. You can choose to have one color or multiple colors at one time. Chinese & English Instruction Manual in the Box. Gifts for Little Kids: It is a great gift for little kid. There is no worry about hurting the eyes of little kid. A ceiling filled by colorful and interesting stars and moon will create a joyful mood for your kid before a nice sleep. Kid will love it more than counting sheep before going to sleep.